White Square - Fine Books & Art - AbeBooks - Easthampon, MA, U.S.A.
Our specialties include modern first editions (American and English, with many signed and inscribed books), poetry, poetry broadsides, and fine press books. Most of our books are contemporary with an emphasis on notable writers and literary prize-winners. Our shop offers a broad range of used books for casual reading and a wide selection of affordable art. Shop hours are Wed-Sat 10 to 5 and Sun noon to 5 (note: we are closed on Sundays June, July, August). 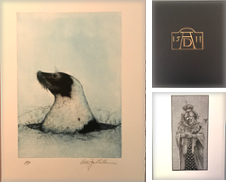 Items for sale include signed woodcuts, engravings, and broadsides.